This post is based on a 1980 article by John E. Fogelberg in the The Daily Times Chronicle, and also borrows from his book “Burlington, Part of a Greater Chronicle.” The would-be dog track location is now a cluster of office buildings along South Bedford Street between the Mall Road the Route 128 overpass. But the winds of change were blowing and many people in town felt that the time was ripe to invite business to come to Burlington to help lower the tax rate, to help pay for schools, to give returning veterans jobs, and to help pay the town’s bills in general. William and Chester Graham ran the 100-acre South Bedford Street farm, which was about to be bisected by the new highway. The brothers, now well along in years — William was born in 1877 and Chester in 1880 — were offered a fair sum for their farm. They accepted a retainer and became almost overnight the focal point of another of Burlington’s hard-fought local issues. Sometime either in 1945 or early in 1946, an association of businessmen, knowing that access to the Graham property would soon be an easy matter, decided the farm and certain other adjoining properties would be an excellent spot on which to build a greyhound dog-racing track. They began to prepare the foundation for acceptance of such a proposition by the townspeople. Burlington was a conservative community and the mere thought of allowing racing and betting within the town raised the ire of many a long-time resident here. But others picked up the idea as a way to raise revenue and tried to promote the proposed track in every way possible. To do this, the Burlington Improvement Association was formed. Its officers were Timothy Regan, president; Fred Williams, first vice president; Henry Rogers, second vice president; Frank Welch, treasurer; Tom Murray, recording secretary; and Mary Bennett, executive secretary. The new organization invited everyone to join and embarked upon a series of weekly or bi-monthly reports, which were mimeographed and became available to everyone in the community. The second report did its best to get the support of the veterans’ organizations by quoting, “At Raynham last year, in the six nights of racing, the entire profits of $53,000 were devoted to charity,” the biggest chunk going to the American Legion at $18,778. The tracks at Raynham and Dighton were in towns similar in size to Burlington and thus were cited in the proposal. The proponents quoted Dighton’s welfare board chairman as saying, “There has not been one welfare case as a result of the track.” This to refute the argument that Burlington’s poor would spend all their money at the track. Article No.8 of the June 19, 1946 Town Meeting asked the voters to change from a Residential B zone to a business zone over 200 acres of land situated on both sides of South Bedford Street, bounded south by Blanchard Road to its junction with Wheeler Road, and then on a straight line northward crossing South Bedford Street again at its junction with Stonybrook Road. The Planning Board held its meeting on the article on May 31 and then recommended to the assembled Town Meeting “that the area in question be changed.” However, only Allan Cronin and Alexander Brown had voted in favor; Carl Hall had voted in opposition and the other two members, Jack Moss and Ralph MacDonald, had not voted at all. The meeting in the old Town Hall was jammed. Every seat in the hall was taken, the gallery was full, the stairs were occupied, the lower hall was crowded, people even stood on the outside fire escape and tried to peer through the open door. The moderator had difficulty controlling the assembly. A motion to move the meeting to the high school was ignored. The attempt to set up a loudspeaker in the lower hall failed. A motion to vote by ballot was passed, Another motion to adjourn did not carry. Everyone wanted to be heard, but it was difficult to hear anything distinctly above the hubbub. The ballot box set up in the banquet hall jammed several times and had to be unlocked and the mechanism adjusted before voting could continue. When it was finally over and the votes counted, the result showed 340 yeas, 252 nays and one blank, a total of 593. This total was challenged, but stood firm. Since the motion needed a two-thirds vote (395) to carry, the rezoning article fell 55 votes shy and lost. Pandemonium, accusations, threats of illegality, noise! Chester MacDonald, the moderator; Maud Graham, the town clerk; and Henry Jackson, the officer on duty, had a very bad night. Soon afterward, the Improvement Association claimed that 150 voters could not get into the meeting hall, rendering the vote illegal. No success. The Grahams returned the retainer and continued farming. The farm was later sold to the Carr-Fastener people and the house was demolished. How orderly and dull are today’s Town Meetings by comparison. Fogelberg never identifies the entrepreneurs or venture capitalists behind the dog track proposal. Surely the Burlington Improvement Association didn’t have the money to build a dog-racing venue. Whoever the money man was, he might have taken his show on the road to Dracut after rejection in Burlington. News archives show Dracut rejected a similar proposal a year later. Greyhound racing is now banned in Massachusetts. 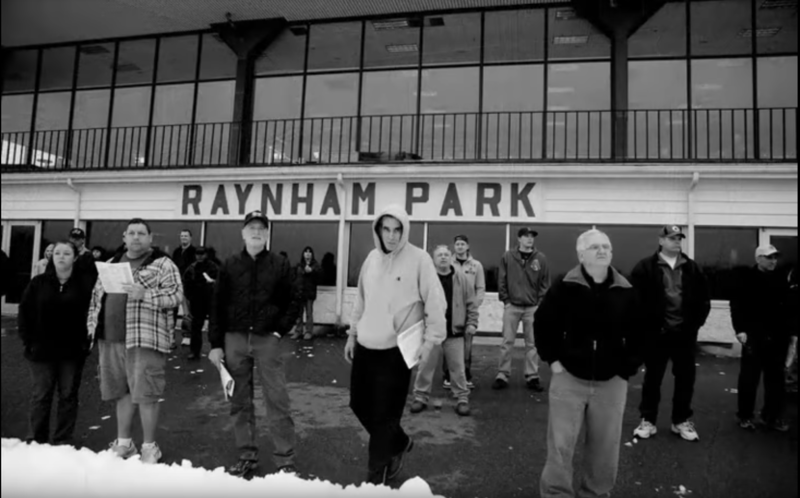 The Greyhound Protection Act of 2008 mandated the closing of the state’s two tracks, Raynham-Taunton Greyhound Park and Wonderland Greyhound Park in Revere, by 2010. On the Facebook page “You Know You’re From Burlington When….” current and former residents alike frequently decry the transformation of our beloved town from a quiet bedroom community to a noisy, traffic-laden commercial and business hub. Imagine what Burlington would have looked like if a dog track had gone in in the late 1940’s. Would Burlington’s development have accelerated even faster? Or would it have been inhibited? I loved reading the article. Seeing all those names from the past was interesting. My family moved to Burlington in 1952 when I was in the second grade. So most of these people were still movers and shakers in Burlington when I lived there. Henry had sold his 80 acres on Lexington street earlier, in 1955. The farmhouse is still there on the road. My living window into 1940’s Burlington.